I found these scans of Naruto and Sukara on MT and actually extracted them like a months or two ago and I just couldn't figure out what to do with it. So this wallpaper has been in my undone pile for a really long time now. I picked it up again today and it turned out very pink. I am not really big on girly pink, but somehow it just seems to fit somehow. EDIT: Updated this wallpaper with version 2. The idea is still the same, but I redid the trees in the background and added the water. It sure is less blury than the original version. Thanks for the advices everyone. Hope you like the new version better. I really like it. I like the sense of depth that you have given it with the trees and leaves...very nice. great work and even great wallpaper. Apart from what people have said about the background being blurry, I think you've got a good character scan. How about redoing the background and using the same characters because when it's sorted, it will be a rocking wallie :) . everything looks nice; except your blurry bg dude, i say make another bg and youll have an even better wallpaper. Hm, hm... I really like the soft background. Especially the trees, they looked a bit speacial to me! Yeap, very nice indeed. And... the scan... of Sakura and Naruto... nice extraction, and with Sakura holding the kunai near to Naruto's head as if she wanna kill him! (And that's definitely not good) Hehe, anyway, nice concept of a wallie. Very nice wallpaper, I like the stock of Naruto and Sakura you used and the background is quite nice as well, good job. you did a really good job on that wallpaper. I love it. keep up the very good work! Thats reallly pretty! I am a bit afraid of how sakura has her kunaii at naruto head :P but u have noticed ey ^^ well i love the bg, great work! This is a good one. Nice job at the background. 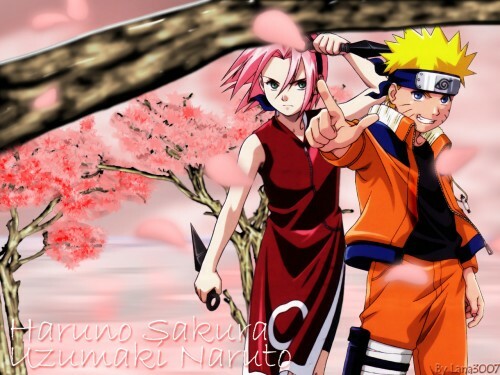 The background fits well with Naruto and Sakura.